Conspicuous macrozoobenthos and vegetation of intertidal sandflats in Königshafen (Island of Sylt, SE North Sea) were mapped in 1932, 1988 and 2008. Higher water levels since the 1930s with a concomitant increase in tidal dynamics are assumed to have weakened sediment stability. This dissolved the distinctly banded macrobenthic zonation of the 1930s. Near high water level, cyanobacterial mats with associated beetles, belts of the mudshrimp Corophium volutator and the seagrass Zostera noltii have vanished, while the range of the lugworm Arenicola marina has extended towards the shore. Near low water level, sandy elevations have become permanently submerged because a tidal creek has widened its bed. In 1988, extensive green algal mats and the almost complete absence of seagrass are attributed to peak eutrophication. This partially reversed until 2008. The mussel Mytilus edulis had strongly extended its beds along the creek in 1988. These were taken over by introduced Pacific oysters Crassostrea gigas in 2008. Also in 2008, the cordgrass Spartina anglica, another introduced species, grew into large tussocks where cyanobacterial mats and a Corophium-belt had been mapped in the 1930s. Former benthic patterns may have little chance of resurrection by conventional nature protection because these small-scale shifts represent responses to regional and global change. Long-term ecological research is essential to understand the composition and functioning of present coastal ecosystems (Müller et al. 2010). During the twentieth century, ecological conditions of coasts all over the world have undergone drastic changes (Valiela 2005; Lotze et al. 2006). In north-western Europe, coastal marine benthos has changed considerably (Rasmussen 1973; Pearson et al. 1985; Rosenberg et al. 1987; Kröncke 2011), including the Wadden Sea (Beukema and Dekker 2005, 2011; Jensen 1992; Kraan et al. 2011; Reise et al. 1989, 2008; Schückel and Kröncke 2013; Weijerman et al. 2005). Most changes in the Wadden Sea have been attributed to eutrophication (e.g. van Beusekom 2005), to the loss of apex predators (Lotze 2005), fisheries (Piersma et al. 2001), artificial shores (Reise 2005), alien invaders (Buschbaum et al. 2012) and to climate change (Beukema and Dekker 2005; Diederich et al. 2005; Loebl et al. 2006; Nehls et al. 2006, Witte et al. 2010). Here, we add a long-term study on sandflat benthos to further unravel small-scale responses to large-scale causes in a coastal ecosystem. A sheltered bay named Königshafen at the northern tip of the island of Sylt in the south-eastern coastal North Sea provides an excellent opportunity for long-term comparisons of marine benthos. In the 1930s, Wohlenberg (1937) investigated habitat characteristics and macrobenthos of the intertidal Königshafen and mapped benthos at selected mudflats and sandflats (Fig. 1). One of these mudflats was revisited by Reise et al. (2008) and considerable changes were revealed. Two sandflats were also revisited in 1988 (Reise et al. 1989). Together with a third sandy site, these three sandflats are the subjects of this study which was performed in August 2008. Previously, it was concluded that changes were mainly due to eutrophication triggering massive green algal mats, an expansion of mussel beds and an increased abundance of polychaete worms (Reise et al. 1989). However, Reise and van Beusekom (2008) suggested that a new direction of change has commenced because nutrient loads into the Wadden Sea have decreased in the last two decades, while temperature, high tide level and the share of alien species have increased. We here hypothesize (1) that increased hydrodynamics affect the benthos of sandy flats even stronger than the benthos of muddy flats due to higher exposure, (2) that recent de-eutrophication has already visible effects and (3) that introduced non-natives have become a major cause of benthic change. Königshafen is a sheltered bay with an extent of 3.5 km (E–W) by 1.4 km (N–S) at the northern end of the island of Sylt in the northern Wadden Sea (SE coastal North Sea). The bay is part of the List tidal basin which is formed by the German island of Sylt, the Danish island of Rømø, the mainland and causeways which connect the latter with the islands. Present tidal range is 1.8 m, salinity approximately 30 psu and mean annual water temperature in the last century was 9 °C (Reise et al. 1994). In the nearby village of List, south of the bay, the Wadden Sea Station was founded in 1924. Several scientists have studied the ecology and geology of Königshafen since then (see Reise et al. 2008). Wohlenberg (1937) mapped and described the macrobenthos of Königshafen in relation to habitat characteristics in 1932 and 1934. His maps and descriptions provided the basis for long-term comparisons of tidal flat sediment types (Austen 1994; Dolch and Hass 2008) and macrobenthos (Reise 1985; Reise et al. 1989, 2008). In August 2008, we reinvestigated three areas mapped by Wohlenberg in 1932 (Fig. 1): an area of approximately 70 × 140 m at the sandy beach of Westfeuer-Watt (WF) (Wohlenberg 1937: Fig. 53), a lagoonal shore at Kersten Rimling (KR) of approximately 400 × 800 m (Wohlenberg 1937: Fig. 21 and 23), and sandy elevations alongside the main tidal channel of Königshafen near Uthörn peninsula (PU) with an area of approximately 700 × 1,100 m (Wohlenberg 1937: Fig. 58). The latter two were already reinvestigated in 1988 (Reise et al. 1989). The exact positions and the scale of the maps drawn by Wohlenberg are not given. Only his Fig. 1 (shown in Fig. 1) is scaled and the locations have to be inferred from that coarse-scaled map. We used historic and current aerial photographs (see Dolch et al. 2013: Fig. 2; Dolch and Reise 2010: Fig. 3) to infer locations. The maps drawn by Wohlenberg are semi-schematic and do not show all organisms encountered. This is obvious when compared to his list of species in Chapter II (Wohlenberg 1937: 24–26). Apparently, he opted for the most conspicuous and what he regarded as the most characteristic taxa and habitat structures. Evidently, he also was fond of beetles. However, we tried to design our survey in the same way to make the results as comparable as possible. Wohlenberg did not explicitly describe his methods of assessment. He visited Königshafen in summer of 1932 and again in the summers of 1934 and 1936. Apparently, he took samples of 500 cm2 to a depth of 30 cm and washed the sediment through sieves of which the finest mesh size was 1 mm. It also seems that he used smaller sample areas where densities of small benthos were high (Wohlenberg 1937: 23). His samples were schematically characterized by surface forms, vegetation, sediment colour, conspicuous strata and water content. He occasionally provided quantitative data but gave more weight to qualitative analysis. We did likewise for the sake of comparison. The problems mentioned above necessitate a cautious attitude to avoid confusing the methodological with the real differences between the 1930s and today. A statistical treatment of the early data sets is not possible. Nevertheless, his detailed verbal descriptions form a reliable basis for the interpretation of his surveys. To create maps comparable with those of Wohlenberg, we used aerial photographs from 1936, 1984 and 2008, Global Positioning System (GPS) and the Geographic Information System (GIS) ‘ArcGIS 10.0’, and grids with qualitative observation points. At study site WF, grid units were 10 × 10 m, while they were 30 × 60 m at KR and 50 × 50 m at PU. At each point, a plot was chosen randomly by throwing a 30 × 30 cm frame. Within such plots, the presence of all taxa visible on the sediment surface was recorded, including characteristic faecal mounds or protruding tubes. Subsequently, the sediment below such a plot was excavated with a fork to a depth of 30 cm and all fauna visible was recorded (see "Appendix"). When necessary, species were identified with the help of a stereomicroscope in the laboratory. In total, 257 plots were sampled, 63 at study site WF, 101 at site KR and 93 at site PU. The position and size of mussel beds and tussocks of Spartina anglica were recorded in the field using GPS. In the same way, the areas were recorded where patches of dwarf seagrass Zostera noltii covered at least 60 percentage of the surface, estimated during low tide exposure when blades were lying on the sediment. Physical changes were not measured in this study but are summarized here from the literature, and geomorphologic aspects are taken from aerial photographs in Dolch (2008). The shape of Königshafen has changed little over the past century except for the embankment of a salt marsh area in the south in 1937 and a peninsula created by nourished sand 70 years ago (Kolumbe 1932; Newig 1980; Bayerl and Hilgelke 1994). Although most of the shores show signs of retreat by erosion, the rate is rather small. Sediments in Königshafen have two sources of origin: coarse-grained sand has been supplied by large mobile dunes which originated at the exposed western shore of the island and migrated over the island into the tidal area, while fine-grained sediments were deposited by tidal waters (Wohlenberg 1937; Priesmeier 1970). The intertidal flats of Königshafen are mainly sandy with interspersed muddy areas. The latter have decreased considerably over time (Austen 1994; Dolch and Hass 2008). Rising water levels and increasing tidal range have presumably caused stronger currents which selectively removed fine-grained sediments, while the coarse-grained sand have remained, resulting in the observed increase of sandiness. Relative mean sea level increased at the nearest tide gauge (List harbour) by 2 mm a−1 between 1937 and 2008 (Wahl et al. 2011). Mean tidal range increased by 3.5 mm a−1 between 1957 and 1987 (Jensen et al. 1992), and the winter storm surge height increased by about 3 mm a−1 between 1958 and 2002 (Weisse and Plüß 2006). All three sandy sites mapped for macrobenthos in the 1930s have undergone considerable change in habitat morphology, species composition and distribution. This sandy shore habitat has changed conspicuously since 1932 (Fig. 2). While dune cliff and beach have remained approximately in the same position, sandy hooks extending from the beach have vanished. Interspersed areas of sand consolidated by cyanobacterial mats and populated by the staphylinid beetle Bledius spectabilis as mapped by Wohlenberg (1937: Fig. 53) are gone as well (Fig. 2). The zonation of distinct belts of macrobiota parallel to the shore as observed in the 1930s has been replaced by bedforms perpendicular to the shore in 2008. This pattern is disrupted by a cluster of tussocks of the invasive cordgrass S. anglica. A small tussock was first encountered in the late 1980s (pers. obs.). In 2008, three large tussocks occurred with diameters of 10, 15 and 16 m and a couple of smaller ones (diameters 1–5 m). Between the large tussocks, a sand bar has developed. The sandy hooks that were 10–20 m long and composed of coarse sand, which was indicated by Wohlenberg (1937), may be precursors of the much longer sandy elevations transversal to the shore observed in 2008 which are distinctly visible on recent aerial photographs. According to Wohlenberg (1937), the short hooks were densely populated by Bledius arenarius and its carabid predator Dyschirius angustatus, while the interspersed lower flats were covered with mats of cyanobacteria and were inhabited by B. spectabilis and the carabid beetle Heterocerus flexuosus. In 2008, B. arenarius and B. spectabilis were not found at this site but are still present in other parts of Königshafen albeit in small numbers. In downslope direction towards low tide level, a second belt was occupied by the amphipod Corophium volutator in 1932 but absent in 2008. A third belt with juvenile and adult lugworms Arenicola marina (Wohlenberg 1937, Abb. 53; Fig. 2) had extended landward in 2008. The juvenile lugworms mainly occurred on the transverse sandy elevations while the adults were found in the lower part of the shore. C. volutator was entirely absent as were the mats of cyanobacteria. This sandy shore habitat has also changed conspicuously since 1932 (Fig. 3). A lagoon partly sheltered by a sandy spit (‘Rimling’ in local language) gradually had vanished. In the 1980s, the spit had already fused with the shore. In the western part of the lagoon, the low salt marsh with Salicornia herbacea (now: S. europaea.s.l.) and Suaeda maritima (Wohlenberg 1937: Figs. 21, 23) grew to an upper salt marsh, and the eastern part was bare sand (Reise et al. 1989: Fig. 4). Until 2008, the vegetated spit grew longer and the sandy beach area became smaller than in the 1980s. The inner part of the former lagoon further grew upwards. An upper salt marsh with Armeria maritima, Festuca rubra and Halimione portulacoides was found in the inner part of the lagoon, while the lower salt marsh persisted only along a narrow channel. The vegetation was short-grazed by sheep. Seaward of the sandy spit and in the eastern part of the lagoon, Wohlenberg recorded mats of cyanobacteria and a dense population of the roof beetle B. spectabilis, followed by a belt of C. volutator in the 1930s. Both the Bledius- and the Corophium-zone were absent in 1988 and 2008. Only a few burrows of B. arenarius were found on the beach. Further, down the slope towards low tide level, Wohlenberg mapped A. marina, followed by a belt of seagrass Z. noltii. This biotic zonation had dissolved in the 1980s. Instead, mats of opportunistic green algae covered a large part of the sediment surface (Reise et al. 1989: Fig. 4). Wohlenberg did not mention any mats of green algae in the 1930s. In 2008, the mats were gone, but a few strings of green algae were found, mainly filiform Ulva spp. and Chaetomorpha spp. A single plant of S. anglica was detected near the shore in August 2008. The range of A. marina has extended since the 1930s. In 1988 and 2008, it was found on the entire sandflat in high numbers. According to Wohlenberg’s map, juveniles and adults of A. marina settled in separate belts in the 1930s. In 1988, this separation was no longer apparent but reappeared to some extent in 2008. A slight reversal may have taken place in the seagrass Z. noltii in this area. In 1932, a dense belt occurred. In the 1980s, seagrass was scattered over most of the area but occurred nowhere in dense patches. In 2008, dense patches were found in a kind of belt at approximately the position of Z. noltii in the 1930s. In addition, few plants of Z. marina were found in 2008. In the lowest part of the sandflat, Wohlenberg found clumps of the blue mussel Mytilus edulis with the attached brown algae Fucus vesiculosus. In 1988, such clumps were not recorded, and in 2008, only a few were found in the area. However, where Wohlenberg mapped M. edulis, we observed the tube worm Lanice conchilega in high numbers in 2008 (Fig. 3). A considerable habitat and macrobenthic change has taken place also near low tide level around the main tidal creek of Königshafen (Fig. 4). The bed of the channel has widened significantly since the 1930s. A large part of the tidal flat mapped by Wohlenberg was permanently submerged in 1988 (Reise et al. 1989: Fig. 5) and also in 2008. South of the tidal channel a peninsula was artificially created by sand nourishment in the 1940s, extending into the survey area in 1988 and 2008. A conspicuous layer of clay was photographed by Wohlenberg and mapped along the southern bank of the creek (Wohlenberg 1937: Figs. 58, 65). In the 1980s, only a small part was still visible and in August 2008, this layer of clay was not exposed during low tide but could be found at 0.3–0.5 m below mean low water level. Along the tidal channel, Wohlenberg mapped sand bars (he wrote of areas with ‘clean’ sand) populated by the polychaetes Scolelepis squamata and Ophelia rathkei together with a tiny roof beetle Diglotta mersa which dwells in air bubbles within loose sand (Wohlenberg 1937: Figs. 58, 61, 62). In 1988, these sand bars were much smaller, while in 2008, they had grown again to some extent (Fig. 4). S. squamata was found in most of them and also a few individuals of D. mersa. On the sandy tidal flats, the lugworm A. marina was widespread at all times, mainly adults. Scoloplos armiger may have become more common than in the 1930s. The area with the tubeworm L. conchilega had increased. In the 1930s and 1980s, it was found at two small plots along the tidal channel, while in 2008, there were three large patches where L. conchilega occurred. Wohlenberg mapped large areas with clumps of M. edulis to which the brown algae F. vesiculosus was attached. However, in the 1930s, only a single distinct mussel bed occurred at the knee of the tidal channel overgrown by fucoid algae and Semibalanus balanoides L. (Wohlenberg 1937: Fig. 59). In the 1980s, mussel beds occurred all along the northern banks of the tidal channel, and some showed scars from commercial dredging for mussels (Reise et al. 1989: Fig. 5). In 2008, beds of M. edulis had been invaded by the Pacific oyster Crassostrea gigas. These were introduced a few kilometres south of Königshafen for aquaculture , were recorded for the first time on a mussel bed in Königshafen in 1991 (Reise 1998), and have increased rapidly in density since 2002. It took over on all mussel beds, although mussels still occur hidden among the larger oysters (Fig. 4). Green algal mats were absent in the 1930s, common in the 1980s (Reise et al. 1989), and in 2008, no mats were found anymore apart from small bunches scattered across the tidal flats. A bed of Z. noltii, growing in an area south of the tidal channel in the 1930s, became covered by the artificial sand nourishment. However, in 2008, a small bed re-emerged near the beach of the nourished area. Three sandy sites mapped in 1932 were reinvestigated in 2008, and two of these also in 1988. We confined data presentation to conspicuous benthic species to avoid confusion caused by methodological uncertainties. It may be presumptuous to infer general patterns of change from no more than three localities and five snapshot surveys. However, the third author visited the sites continuously since the 1970s, and the presented maps show consistent changes which allow us to hypothesize three prevalent processes changing the benthos of the sandy intertidal since the 1930s: (1) an increasing tidal range and high water level entailed hydro- and sediment dynamics which in turn caused the loss of benthos associated with calmer and more stable conditions; (2) in the 1980s, eutrophication effects became apparent but declined again until 2008; and (3) while two introduced, non-native ecosystem engineers have presumably caused permanent change. These inferences are compared to results of other long-term studies on intertidal flats in the Wadden Sea to explore consistency in this ecosystem. One cannot expect distribution and composition of macrobenthos to remain the same when the physical regime has changed. In Königshafen, water levels have increased since the 1930s. According to the local tide gauge, relative sea level has risen by 14 cm since then (Wahl et al. 2011), and mean high tide level has increased by approximately 20 cm and tidal range by 30 cm (Jensen et al. 1992; Weisse and Plüß 2006). There is concern that an acceleration of global sea-level rise associated with climate warming is already underway (i.e. Vermeer and Rahmstorf 2009; Kemp et al. 2011). However, there are also various regional and local factors such as embankment or reduction of tidal catchment area which may contribute to higher water levels in our study area (Weisse and Plüß 2006; Wahl et al. 2011). Also since the 1930s, an advancing sandiness has been noted for Königshafen (Austen 1994; Dolch and Hass 2008). This and higher water levels imply that hydrodynamics in the bay have become stronger and sediment less stable than eight decades ago. Morphological changes at the three study sites and a mudflat (see Reise et al. 2008) support this conclusion. The loss of sandy hooks at Westfeuer-Watt (WF, Figs. 1, 2) and the retreat of a sandy spit at Kersten Rimling (KR, Figs. 1, 3) point to erosion at the shore. At the third site (PU), the considerable widening of the channel bed indicates even stronger erosion at low tide level and below. At the two nearshore sites, loss of mud and decreasing sediment stability and increasing sandiness are indicated by three biotic changes: (1) the loss of cyanobacterial mats, (2) the loss of dense belts of the mudshrimp C. volutator, an amphipod known to dwell in muddy sediments of the upper shore where the lugworm A. marina is scarce (Flach 1996), and (3) the concomitant spread of A. marina, known to avoid muddy sediments (Reise et al. 2001). The appearance of large sandy bedforms perpendicular to the shore at Westfeuer-Watt likewise points to increased sediment mobility (Dolch and Reise 2010). A long-term loss of C. volutator also occurred elsewhere in Königshafen (Reise et al. 2008) and in other parts of the Wadden Sea. In Jade bay of the southern Wadden Sea, a benthic comparison to the 1930s also revealed a decreasing population of C. volutator (Schückel and Kröncke 2013). This is a sheltered bay with extensive muddy flats where an increasing sandiness has not been observed. Thus, there may be other, more regional causes for the decline of C. volutator, and more research is needed on this issue. However, for Königshafen, we suggest that increased hydrodynamics have been the ultimate cause of change in the nearshore benthic zone. This conclusion is supported by Puls et al. (2012) showing large-scale benthic patterns on tidal flats to be best predicted by hydrodynamics. The effects of sea-level rise on the sedimentary system of the Wadden Sea are still under discussion (van Goor et al. 2003; CPSL 2005; Wang et al. 2012). Tidal basins are expected to respond individually, depending on size, tidal volume and shape. The larger the tidal basin and tidal inlet, the lower may be the ability to retain sediments. The negative sediment budget of the large List tidal basin—to which Königshafen belongs—has already been pointed out in Gätje and Reise (1998). In smaller tidal basins, sedimentation still tends to compensate sea-level rise. In the Wadden Sea, eutrophication has been shown to have aggravated since the second half of the previous century, culminating in the 1980s and easing off since the 1990s (van Beusekom 2005). Some of the benthic changes we observed may reflect this development: (1) absence of green algal mats in the 1930s, their extensive occurrence triggered by a high nutrient supply in the 1980s, and only few green algal strings in the 2000s. At a nearby mudflat, green algal mats were still common but variable throughout the latter period (Reise et al. 2008). In the Wadden Sea, green algal mats attained a maximum in the early 1990s (Kolbe et al. 1995; Reise and Siebert 1994) and have varied in extent with nitrogen load in the riverine runoff since then (van Beusekom et al. 2009). (2) A distinct belt of intertidal seagrass, which is sensitive to eutrophication, was present in the 1930s, almost absent in 1988, and present in patches of Z. noltii in 2008. Dolch et al. (2013) reconstructed the extent of intertidal seagrass beds in the entire Northfrisian Wadden Sea including Königshafen bay since the 1930s and found a decline until the 1990s when an ongoing recovery commenced. The intermittent losses are assumed to be mainly caused by adverse effects of sediment mobility and by eutrophication (Dolch and Reise 2010; Reise and Kohlus 2008). A similar long-term trend was observed in Jade Bay where eutrophication is regarded to be primarily responsible for this development as sediment dynamics have not been evoked to have had an effect (Schückel and Kröncke 2013). (3) A more uncertain link to eutrophication may be the increase in mussel bed area from 1932 to 1988 along the tidal creek in Königshafen. This was suggested by Reise et al. (1989) and for Ho Bay, about 50 km north of Königshafen, by Jensen (1992), assuming an effect of increased phytoplankton food. An increase of mussel bed area from the 1930s to the 1970s and a subsequent decrease has been recorded for Jade bay in the southern Wadden Sea (Schückel and Kröncke 2013). While the increase might have been an effect of eutrophication, the decrease here and in the western Dutch Wadden Sea has been attributed to the mussel fishery (Herlyn and Millat 2000; Kraan et al. 2011). Nehls et al. (2006) attribute a recent decrease in mussel bed area around the island of Sylt to recruitment failure, most likely caused by predation on mussel spat, probably facilitated by a series of mild winters (Beukema and Dekker 2005). Processes like these may have also affected mussel bed area in previous times, and eutrophication may not have been the only major factor. 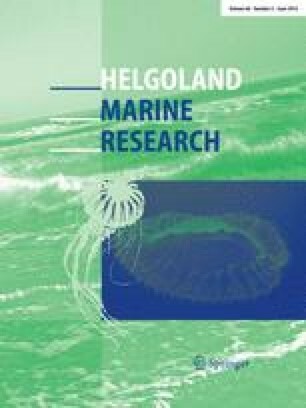 The advancing tide of introduced alien species in the Wadden Sea has been reviewed by Buschbaum et al. (2012). At our study sites, two conspicuous invaders have altered the benthic pattern since the 1930s: (1) tussocks of the cordgrass S. anglica became established on the sandflat at Westfeuer-Watt (Fig. 2). This was already recorded by Loebl et al. (2006) who propose that increasing summer temperature since the 1990s has facilitated the spread of S. anglica. We also found a single pioneer plant at Kersten Rimling (Fig. 3) which point to a further spread in Königshafen. (2) In 2008, all mussel beds along the tidal creek of Königshafen were overgrown by the Pacific oyster C. gigas. At closer look, mussels remained abundant among the larger oysters, but the latter provided the main benthic structure. The area covered by mussel beds in 1988 and oyster beds in 2008 was similar. C. gigas became dominant on mussel beds in the List tidal basin since 2002 (Diederich et al. 2005; Büttger et al. 2011). The spread of C. gigas is assumed to have been facilitated by the mussels themselves as they provided a hard substrate suitable for oysters to grow at. Higher summer temperature, which promote oyster recruitment, is recorded since the 1990s, and a massive decline observed after winters with destructive ice shear (2009/2010 and 2010/2011) indicates the importance of climatic change. The introduced S. anglica and C. gigas function as ecosystem engineers (Bouma et al. 2009; Tang and Kristensen 2010; Kochmann et al. 2008; Markert et al. 2010) and affect the entire benthic assemblage structure. For both species, there is no evidence that these non-natives may lose again their prominent role near high and near low water level, respectively. S. anglica is occupying a niche that was not occupied before by any native species in Königshafen. C. gigas seems to occur beside mussels that dominated the same locations before. Both introduced species may provide habitat structures for further non-natives. Other studies on long-term change in the benthos of the Wadden Sea have shown that alien species significantly increased species richness in this ecosystem (Beukema and Dekker 2011; Schückel and Kröncke 2013). Comparing the macrobenthos of sandy tidal flats in Königshafen of the Island of Sylt from the 1930s, 1980s and 2000s, we found that conspicuous species have undergone a strong change over the last decades. The apparent zonation outlined by Wohlenberg (1937) for the sandy nearshore zone disintegrated because major components have become scattered, rare or lost: cyanobacterial mats with staphylinid beetles vanished, a distinct belt of the mudshrimp C. volutator is entirely gone, and a belt of seagrass dissolved into patches. Particularly, the lugworm A. marina has occupied the space where these assemblages had been in the 1930s. This indicates an advancing sandiness at these sites. Tussocks of the introduced cordgrass S. anglica, and large sandy elevations further contribute to the change. Close to low water level, a tidal channel has strongly widened its bed and epibenthic suspension feeders attained a much larger bed size than in 1932. This spread was accomplished by the mussel M. edulis which later became partially displaced by the introduced Pacific oyster C. gigas. As major drivers of these presumably irreversible changes we suggest rising water levels and the biological globalization due to species introductions. Both drivers are likely to proceed. Higher water levels have entailed enhanced hydrodynamics, which in turn caused higher sediment mobility which altered habitats and benthic patterns. As ecosystem engineers, non-native S. anglica and C. gigas have not only the potential to affect other species already present but may facilitate the establishment of other alien species. The third driver assumed to have effects on benthic long-term changes is eutrophication. Other than sea-level rise and species introductions, a recent turn to de-eutrophication may reverse the effects. However, considering hysteresis and the impossibility to return to natural nutrient levels, eutrophication effects are likely to remain in the Wadden Sea, albeit at a lower level. For their significant help and support during field campaigns, we would like to thank Elisabeth -Lilo- Herre and Karolin Thomisch.